MARVA Collins probably has a better sense of well-being than Kim Kardashian, Cicely Tyson and Morgan Freeman, though all are likely pretty happy these days. Indeed, neither KK, CT or MF are too far down in the dumps or anything; it's just that they and MC derive a good deal of their happiness from different pursuits. In what researchers are calling a first-of-its-kind study, they found that people such as Mother Teresa types who derive their happiness (called eudaimonic well-being) from a deep sense of purpose and meaning have a better human genome profile than those such as celebrities who derive their happiness (called hedonic well-being) from "consummatory" self-gratification. 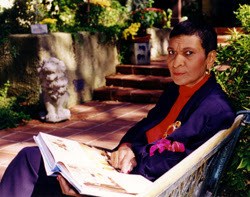 (See video at top of "The Marva Collins Story" starring CT and MF). This matters because the human genome is a system of thousands of genes whose main raison d'être is to aid human survival and well ... well-being. This is the kind of happiness that can help a body stave off debilitants such as bacterial infection from wounds caused by social conflict and an increased risk of viral infection associated with social contact, according to UCLA professor and lead researcher Steven Cole. Kim Kardashian is experiencing the joys of motherhood and unswollen ankles. Archive photo. The researchers from UCLA and the University of North Carolina reported their findings in an article titled "A functional genomic perspective on human well-being." It appears in the current online edition of the journal, "Proceedings of the National Academy of Sciences" (http://www.pnas.org). SC and his team studied 80 healthy adults for hedonic and eudaimonic well-being, taking into account variables like negative psychological and behavioral factors. They discovered that all of the adults felt about the same but the ones with higher levels of eudiamonic well-being had a better gene profile than those with hedonic well being. "Both seemed to have the same high levels of positive emotion," SC said. "However, their genomes were responding very differently even though their emotional states were similarly positive." Even if the study is off the mark it would seem that it is better to derive happiness from something meaningful than mere self-satisfaction, not that there is anything wrong with that. Taking celebrities, for instance. Oprah has both eudiamonic and hedonic well-being. She is a billionaire after all who owns a network and is an actor who has a starring role in "Lee Daniels' The Butler." On the other hand, Oprah has a school in South Africa, gives generously to various causes and spent many years on the "Oprah" show doing programs that uplifted viewers, providing information and resources to help them help themselves and make the world a better place - very meaningful indeed. Contrast Oprah to, say, Donald Trump. The latter is a billionaire real estate tycoon who seems only to act in ways that enrich himself. Even his TV shows, "The Apprentice" and "Celebrity Apprentice," are about him. Often when he takes a stand it is viewed as self-interested. Consider his recent marks about Paula Deen and Rep. Charlie Rangel, D-NY. (See video above). Or his role in the birther movement. Marva Collins has hundreds of reason to be happy. Archive photo. On the surface at least, Oprah has a better gene profile than The Donald; she has a better chance of fighting off infectious diseases. "What this study tells us is that doing good and feeling good have very different effects on the human genome, even though they generate similar levels of positive emotion," UCLA's SC said. "Apparently, the human genome is much more sensitive to different ways of achieving happiness than are conscious minds." In other words, meaningful good deeds do your genes good and your genes do you good. Visit http://www.bit.ly/1eKnFco to read the article.